We work with thousands of restaurants that choose to grow their small, family owned businesses with SMS marketing. Not only is this mobile communication tactic immediate and affordable, it’s also incredibly effective. Long term, you can cultivate a loyal customer base, and reward each individual for their effort to connect. Tons of local restaurants invest in grassroots marketing options that don’t always offer the greatest return. For example, newspaper ads or radio spots have become a go to solution, but the return isn’t necessarily trackable. You can throw hundreds of dollars at each of these methods, but never truly know how effective they are at generating business. With that said, how can you really measure the effectiveness of each marketing method? At Slick Text, we always recommend calculating your ROI, or return on investment. This helps you evaluate the long term sustainability of each method, and what results you’re getting in exchange for your initial investment. 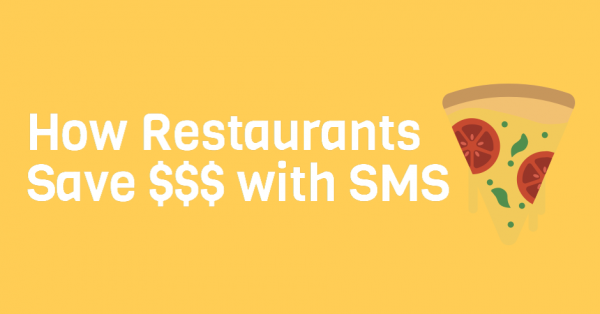 So first things first, restaurants save money with SMS marketing by eliminating all other ineffective methods. Instead of shelling out hundreds of dollars for a so so newspaper ad, or dishing out thousands for a one time radio spot, restaurant owners are getting smart about how they spend. In addition, exclusive mobile coupons enhance offer redemption, so restaurant owners aren’t sitting on tons of leftover inventory. If you follow your SMS marketing best practices, you can quickly churn through your incoming stock. No dish will go untouched, no product spoiled. Finally, SMS marketing saves money because of the simple and easy to use long term effectiveness. Once business owners master this mobile marketing technique, they have a permanent go to solution. As long as they provide subscribers with value, they’ll never have to look to another marketing method.